ClockLink.com provides fashionable clocks that you can easily embed in your web page. All you need to do is simply paste the tag on your web page. Our clock will display the city name of your choice if you choose. You can also choose a time zone for your clock so it will show the correct time. Decorate your website with our clocks! clocks viewed in 24 hours. The above graph provides a glimpse into the amount of views Clocklink clocks have received worldwide in the last 24 hours. 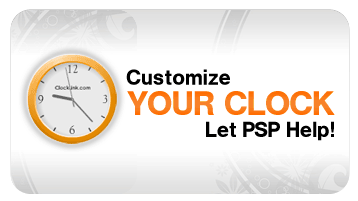 If you or your business would like a custom clock, contact PSPinc! Call PSPinc toll-free at 1-800-232-3989, or through e-mail by visiting our contact page and filling in our online contact form. Visit PSPinc's web site for information on more great products and tools that will enhance your business' online experience.